Free money for green infrastructure! Many small individual actions by so-called "watershed stewards" can add up into major benefits for San Francisco's watersheds and sewer infrastructure. Building upon this premise, the San Francisco Community Challenge Grant (CCG) program has partnered with the SFPUC Urban Watershed Management program to announce the launch of the application cycle for this year's Urban Watershed Stewardship Grants (WSG). 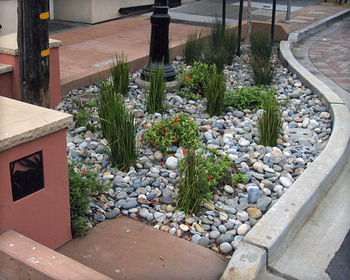 Grants of up to $100,000 will be funded to support "green infrastructure" projects including rainwater harvesting and re-use, the removal of impervious surfaces, and the installation of rain gardens, permeable paving, and bioretention planters. Eligibility for grants is limited to community groups, nonprofit organizations, merchant associations, schools, and community benefit district organizations. More information is available online. This year's grant application deadline is March 24, 2017. Throw your hat in the ring for a piece of the action, and do your part to make San Francisco a more sustainable city.